Craig, give me all you've got! If you want VIP access to the best fat burning and muscle building workouts that give you the option of training with dumbbells one month and bodyweight exercises the next month, then you're about to discover an incredible deal that will give you the ability to pick and choose from over 137 Turbulence Training workouts at your leisure. 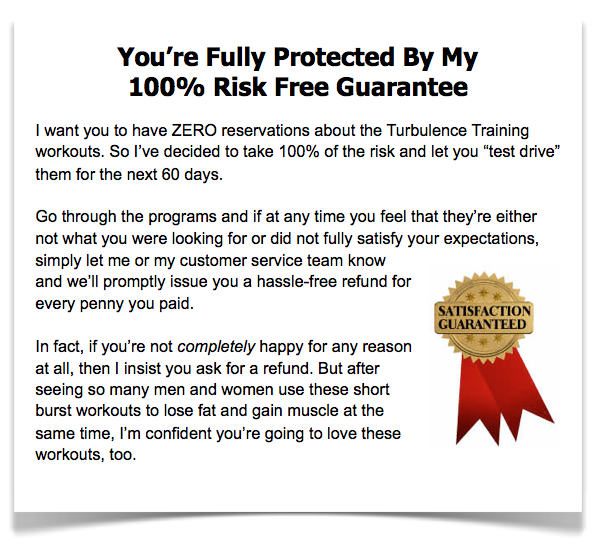 This incredible opportunity to access the complete Turbulence Training workout and online video vault for only pennies per workout is exclusive to TT VIP readers only. In the Ultimate Platinum Turbulence Training Deal you'll get access to all the Turbulence Training workouts and online videos, AND you'll be able to ask all your fat loss and nutrition questions on the Discussion Forums. A One Year Platinum Turbulence Training package normally sells for $297, but with this special Ultimate Platinum Turbulence Training offer you'll get all 137 workouts for less than $1.44 each. 113 - April 2014 - To be announced shortly! All this for only $197 - saving you hundreds of dollars if you order today. Click here now to grab your Ultimate Platinum Package for $197. "What I appreciate most about Craig's system is its simplicity. I am now spending less time in the gym than before and getting my best results ever. Of course, although the TT workouts are intense, fun, and incredibly effective, they were only one of several contributing factors to my success. During my 12 week journey I lost 15.5 lbs, inches off everywhere, and 5.3% body fat." "I began Craig's program quite skeptically. But I can say that I am pleasantly surprised at how much I enjoy it. It was the 4-minute sessions that interested me at first, but it wasn't long before I was starting to move on with the 10-minute series or both. I know the program says to do them every other day, but it is really hard to not do them every day! I feel good about myself and this program, and I am totally amazed about that." "As of today, I'm under 220... Lost 30 lbs with TT! Thanks for the help and encouragement. I love the website. Super intuitive and easy." "Hello Craig I don't even know how I found out about your program But I am on my 2nd week and loving it. Just did my second workout of the series Workout #6 on the 20/10 program.. I LOVE LOVE IT. Thank you for your Inspiration." "Yes, the workouts don't waste my time (which is at a premium with two little kids), and they are effective. Also, speaking as a massage therapist, I find that they are less likely to cause overuse injuries than p90x or "homemade" workouts that many of my clients have done." "Hey Craig, I've been a member since 2009 or so. I have the majority of your turbulence training workouts and have lost close to 50 pounds thanks to you. I just signed up to TT 2.0 to try the follow along workouts. I'm already seeing where I've been slacking as far as rest periods go. I really think you're onto something great." "It works! After trying everything else this works and its easy to follow, straightforward guide and fantastic workouts that constantly challenge and shock the body." "I recommend Turbulence Training. I have done P90X 4 times in 3 years and Insanity 2 times. I'm 55 and I thought Insanity was doing more damage to me than good and I wanted to try a shorter workout. I received the workouts and I watched a few of them and thought this won't be that bad. I wasn't in too bad of shape so I started at the Intermediate workout. Well, it was an awesome workout!!! You get a lot in a 30 minute workout!! I had a TRX I hadn't gotten to use yet and it really hits a lot of muscles. I just started month 2 with Advanced 2K3 and it's a step up from Intermediate! Wow!! I highly recommend this workout package!!" "Craig, I want to thank you for the continuing education I am receiving by being a TT member. I get the best workouts of my life all in a small area of my basement using the Turbulance Training manuals." PS - If you want to lose fat and build muscle with almost any equipment, along with all of my workouts for only $197 - a savings of OVER 33% - then grab this offer today because this special offer is only available for a limited time! PPS - Your results are guaranteed by my 100% money back promise. If you aren't satisfied with your results from the program, just email us and let us know at support@turbulencetraining.com and you'll be refunded your $197 before the end of the 60-day period.